When I saw that Alistair Reynolds had a story in this compilation, I knew I needed a copy of the book. I have reviewed several of his very hefty sci-fi novels in the past and been engrossed in each one. His short story, "Handfast", does not disappoint. A quietly brilliant story about two mortal enemies stranded, doomed to die, who decide to discover each other's "humanity". Another gem is "Regarding the Robot Raccoons Attached to the Hull of my Ship", where sisters fight over the fate of a planet, family relationships...... and good cookies. Altogether, there are over 600 pages filled with delightful stories of space, futuristic activities, AI's and all that encompasses great sci-fi writing. A very enjoyable book that I highly recommend to the sci-fi fans out there. Also, if you aren't a fan, but are dabbling with reading this genre, this would be a perfect starting point for you! This is my current "car book", perfectly sized short stories for lunch time reading! The third volume in a new year’s best series. This book will feature science fiction short stories/novelettes/novellas originally published in 2017. To keep up-to-date with the most buzzworthy and cutting-edge science fiction requires sifting through countless magazines, e-zines, websites, blogs, original anthologies, single-author collections, and more―a task accomplishable by only the most determined and voracious readers. For everyone else, Night Shade Books is proud to introduce the latest volume of The Best Science Fiction of the Year, a new yearly anthology compiled by Hugo and World Fantasy award–winning editor Neil Clarke, collecting the finest that the genre has to offer, from the biggest names in the field to the most exciting new writers. The best science fiction scrutinizes our culture and politics, examines the limits of the human condition, and zooms across galaxies at faster-than-light speeds, moving from the very near future to the far-flung worlds of tomorrow in the space of a single sentence. 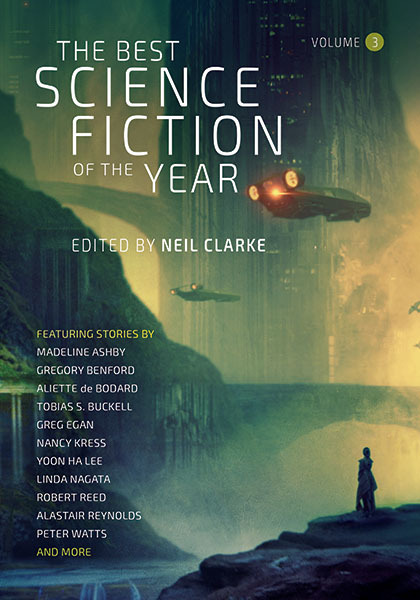 Clarke, publisher and editor in chief of the acclaimed and award-winning magazine Clarkesworld, has selected the short science fiction (and only science fiction) best representing the previous year’s writing, showcasing the talent, variety, and awesome “sensawunda” that the genre has to offer.